I’ve never met anyone who loves packing. In fact, I think packing is the most daunting, upcoming-trip-buzz-killer there is. Incorporating necessities, comfort and style – and resisting the urge to pack everything you own – can be a real struggle. I used to be an over-packer with a packing list that went on forever. I was the traveler who checked two large suitcases for a one-week vacation…and only wore about a fifth of what was packed. However, those days are long behind me. The more I traveled, the savvier I became. Coordinated outfits, essential toiletries and sensible shoes were the items I packed. I had a streamlined formula that destroyed my packing dilemma. I could pack for a week-long, overseas trip in about an hour; for weekend jaunts, I could pack and be out the door in 20 minutes’ time. 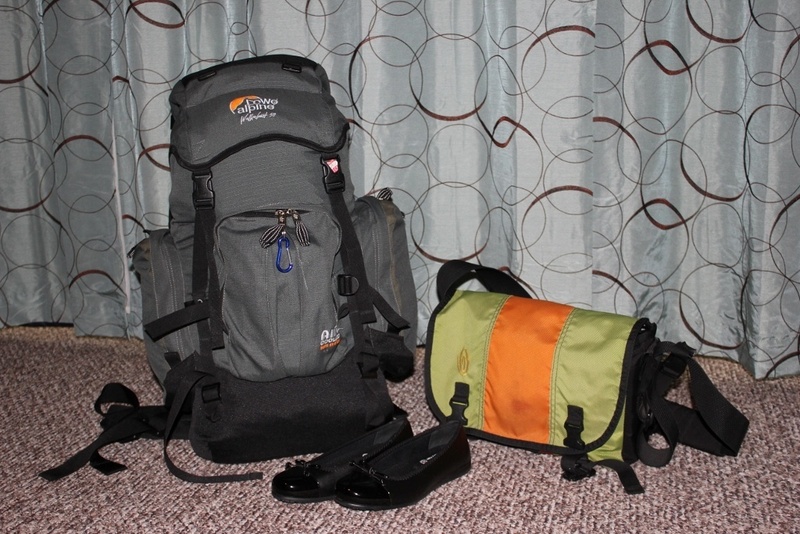 My detailed packing list includes every item I carry – including the bags I carry it all in. It is, perhaps, important to note that while we are full-time travelers, what I pack does not differ greatly from what I used to pack for week-long vacations. I divulge this information in an effort to help other travelers create their packing lists, but packing is extremely personal. My best packing advice: pack what’s comfortable! Some of the links on this site are Affiliate Links and if you use them to make a purchase, we may earn a small commission. For more information, read our Disclosure Policy. When we first left to travel the world, I didn’t pack enough shirts – I only had 1 tank top, 2 t-shirts and 3 long sleeve shirts in my bag. I was constantly doing laundry in both warm and cold weather climates. I have since added additional shirts without adding too much weight to my bag, which has resulted in seriously cutting down on the time I spend sink washing my shirts! ExOfficio underwear are all the rage for travelers – but, personally, they haven’t lived up to expectations due to an awkward fit, color breakdown and ripped elastic. I still travel with them (mostly because of the money I shelled out to buy them), but I much more prefer wearing the breathable Fruit of the Loom bikini underwear – which cost a mere fraction of the price of ExOfficio. My wrap is multi-functional – and, in my opinion, an essential item for travelers. In addition to its obvious purpose, I have used mine as a beach towel, bath towel, picnic blanket, airport blanket and bus pillow. The one I carry is black, thin and cost less than $10. We travel in all seasons, so the additional caps and gloves are necessary (and have been added since we first started traveling). However, for a shorter, destination-specific trip, I would choose between thin and wool, rather than packing both. And, quite obviously, completely unneccessary if traveling to warmer climates. I have also traveled with slip-on Skechers. I loved my Skechers, which could be worn for city walking, trail hiking and in inclement weather, but the new versions have a plastic-like sole, rather than rubber. I was slipping on concrete. So, I switched to Columbia, which are also good for cities and on trails, but not so great in rain and snow. I’m still in search of the perfect, versatile, everyday travel shoe. A pair of flats can help dress up any outfit – and mine weigh practically nothing. When I’m ready for a new pair, I’m set on buying foldable flats. I used to travel with disposable facial cloths (cut into halves or quarters to make the box last longer), but now just use regular soap to wash my face. Bathroom essentials are available all around the world, so replacing these items while traveling is never an issue. However, in some places, the price of sunscreen and shaving cream is ridiculously inflated, so it’s best to bring your own. Re-fillable, travel bottles are the way to go for bathroom essentials like lotions and shampoo. Many travelers swear by the GoToob brand. Many of these items are sold together in a convenient toiletry travel kit. Slim down your make up bag to the essential items – which may be more (or less!) than what I carry. Medicine bottles can take up a lot of space and it can be tempting to just mix all the medications together, which isn’t ideal. I use small, individual jars with screw caps to store medications – and use a marker to label each bottle. A weekly pill box could also work. Ladies: In some countries – like many in South America and in the Balkans – choice of feminine products isn’t as liberal as in other parts of the world. If you have a preference for tampons, you should pack them, as they may not be available where you are traveling. Some female travelers like to use the Diva Cup. I have gone through several pairs of sunglasses since we started traveling. I started with my favorite – and expensive – pair of Maui Jim sunglasses, but lost them while in Ireland. After that, I went ultra-cheap…and wasn’t surprised when three consecutive pairs broke just after a few weeks of use. I currently travel with a moderately-priced pair of polarized sunglasses, but I’m looking forward to the day I upgrade to Maui Jim’s again. The bottle opener we carry is pretty basic, but if we ever need to replace it, we will do so with a multi-functionsl tool – or an airplane opener just for fun! Travel corkscrews are great – but, if you are flying, only pack them if you intend on checking luggage. As digital nomads, carrying these electronics are essential. It does, however, complicate travel days. We splurged on packing cubes and compression bags before we started traveling full-time – and it was, without a doubt, one of the very best pre-travel purchases we made. We cannot imagine traveling without them! Hi! I am looking to purchase a medium hardcase suitcase for travel overseas but there are so many options – would you recommend any in particular? Looking at American Tourister Bon Air or Flylite Lux . thanks so much. We hope you find the right one for your travels, we certainly understand how important it is! How do you fit that many clothes in your pack?? 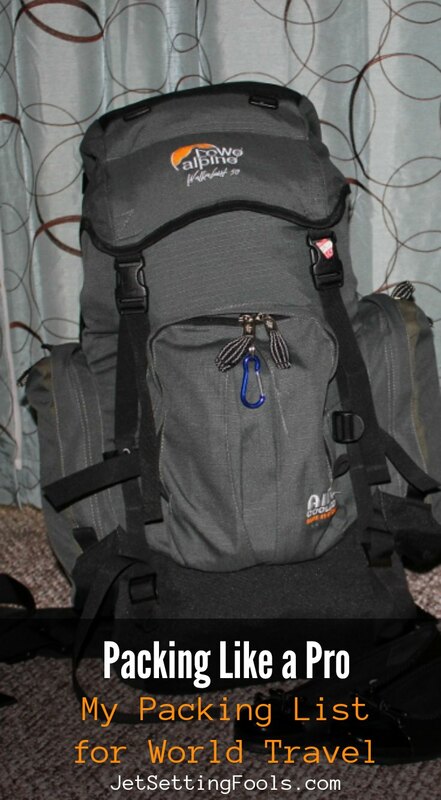 I pack half of the amount of clothes you have on your list & am still struggling to zip it up into my 45L backpack. Is it the packing cubes? I still don’t understand how they save space. Yes! It is 100% the packing cubes! The lightweight bags are made of incredibly durable material and it cuts my bulk IN HALF! Admittedly, though, my backpack’s name is Porky because it is stuffed to the brim like a sausage. I have a top-loading bag, which doesn’t require zipping, either. However, if you get the Eagle Creek Pack-It system, I’m certain you will condense your items! Good luck! Hi, I just discovered your website today and I really like the way you present all your information. The walking guides that I have looked at are full of great information. I am going to Europe with family for December & January (this weekend includes skiing for a week). I am a ‘plus-size’ lady and I am very anxious about packing for this holiday. Any packing tips or advice your could offer would be very appreciated. Oh Sue, I’ve been there! 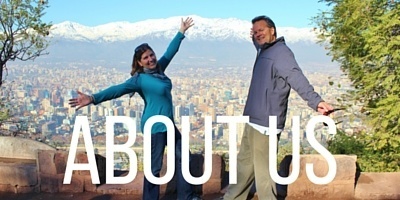 The packing list is everything I own as we travel full-time! 😉 For your 17 day trip, you could probably pack less (since you will only be there for one season). Try to coordinate outfits so that you can minimize accessories to enhance all the outfits you bring. There are also places in Split, Croatia where you can drop off your laundry and they will wash, dry and fold it for you for $10 usd – and many accommodations offer use of a washing machine – so check with your lodgings (and pack a some detergent…Tide makes a great single load packet or pack powder detergent in a ziplock bag). It’s also important to pack a good pair of comfortable, slip-resistent walking shoes for Old Town exploration and light hiking (like at Plitvice Lakes). That is one awesome packing list. Thanks for sharing this information, it has been VERY helpful!! You guys are the best. Thank you, glad you found it useful. Happy(?) packing! I feel over loaded with info.